If you are retailer and are interested in developing a mobile phone recycling program to help clean up the environment and support your philanthropic endeavors, ARP represents the model partner providing support and advice for your business. ARP is the most advanced and innovative mobile take-back program in Australia providing full logistical and environmental solutions. 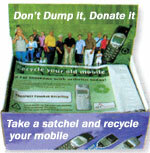 We manage everything from the initial collection of phones from your retail outlets through to re-use or recycling. We are able to offer a complete solution, which delivers significant financial gain and triple bottom line benefit for retailers whilst also complying with all current and environmental guidelines. 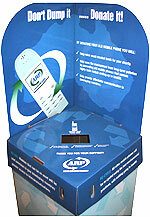 From the beginning ARP works closely with you in developing and implementing innovative marketing campaigns to encourage consumers to donate their mobile phones for recycling. These campaigns can be part of your current and existing business activities and marketing initiatives. For retailers which locate public collection boxes or ARP satchel dispensers in their stores to collect and recycle phones, it demonstrates corporate responsibility. Further it also makes good business sense as it helps build a customer base by bringing in people into stores and providing customers and potential customers with a way to feel good about themselves and the company/store who they do business with. Further the consumer may be apt to make a purchase while dropping off their handset or picking up a Pre-Paid satchel. ARP has invested heavily and developed a state of the art software system that allows us to provide retailers with valuable statistical, financial, and marketing reports. We gather customer and product profile information that can be used for targeted marketing strategies. If you are interested in working with ARP please contact steve@arp.net.au. We will come to you and make a formal presentation about our program and the many benefits we have to offer.